The long winter wait endured by racing fans the world over is coming to an end as the Movistar Yamaha MotoGP Team gather in Madrid to officially launch their 2015 campaign in the quest for title victory. A winter of development by Yamaha engineers and exhaustive training by the riders sees a formidable team gathered and ready to prove themselves against the best in the world. The 2015 season will be the second year of partnership between the Yamaha Factory Team and Spanish company Telefónica. The five-year collaboration started in 2014 looks set to grow from strength to strength, making Telefónica’s headquarters in Madrid the perfect venue to unveil the 2015 livery. The formidable duo of Italian Valentino Rossi and Spaniard Jorge Lorenzo remain unchanged as the rider line up for the team. Nine-time world champion Rossi delighted the racing world in 2014 with an impressive season, returning to form as a key protagonist. ‘The Doctor’ increased the pressure round after round to finish the season in a well deserved second position. Four-time world champion Lorenzo had a tougher start to the season but went on to find his rhythm, keeping his teammate firmly in his sights in the podium battles that marked the climax to the year and earning him third in the final standings. 2015 sees them both heading to Sepang for the first test of the year in top form, both physically and mentally, and as very real title contenders. 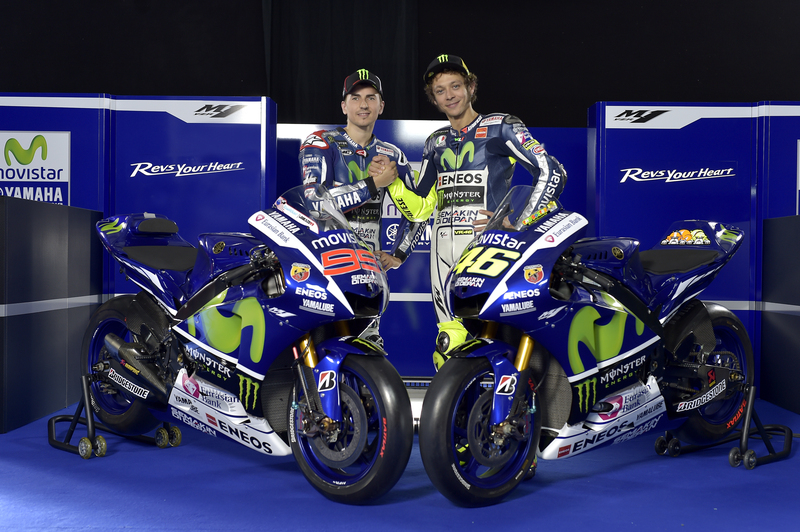 The 2015 Movistar Yamaha MotoGP Team line up is unveiled for the first time at the Distrito Telefónica in Madrid, the headquarters that is normally home to a workforce of 14,000 employees. Presenting the team were MotoGP superstars Valentino Rossi and Jorge Lorenzo, alongside the president of Telefónica España, Luis Miguel Gilpérez. They were joined by the General Manager of Yamaha Motor Co., Ltd’s Motorsport Division, Kouichi Tsuji, the Managing Director of Yamaha Motor Racing Srl, Lin Jarvis, and Movistar Yamaha MotoGP’s Team Director, Massimo Meregalli. The ceremony saw the 2015 Yamaha YZR-M1 revealed in its new colours with a revised and resized Movistar logo and a refreshed livery. Also presented were the Team’s new partners: Abarth, the FCA Group’s prestigious, sports oriented, brand that joins Yamaha on a two-year partnership, and Cromax, the global coatings brand for refinish body-shops. Abarth and Cromax were not the only new faces as Japanese technical clothing manufacturer Descente joins as the clothing provider for the team. The team now travels to Malaysia where the season will officially kick off with the first test at Sepang on 4th, 5th and 6th February. This will be the first opportunity for the riders to shake-down the 2015 YZR-M1 before the beginning of the championship in Qatar on 29th March. “The presentation of the new season is always a special moment. On this occasion I see for the first time my new bike, the new colours and new lines. Every time for me this is a big emotion. To present the bike and team means that a new season is about to start. The desire to start a new challenge is really huge, especially after the positive end of the 2014 season. Finishing second in the world championship was important, but this year the goal is even higher. Yamaha have worked so hard during the winter, and me too. I am in good shape, I feel good, I’m training a lot and I’m ready to begin the hard work at the Sepang Test. The new bike is really beautiful; I really like it. Now I want to meet up with my team and work with all of them to achieve the best possible results. It will be a very interesting season. I will have very strong opponents, starting from my teammate who will surely be better prepared this winter. It will be important to do a good test and arrive at the first race with everything in the right place, then we will be ready to fight for victory”.